Congratulations to Paige Sinnamon who competed on Sunday 22 April at the Equestrian Australia ANZAC Show. Paige won all of her Interschool events representing St. Hilda’s, qualifying her to represent the School later in the year at State Titles! She also won her classes to represent QLD at Southern Stars next year. 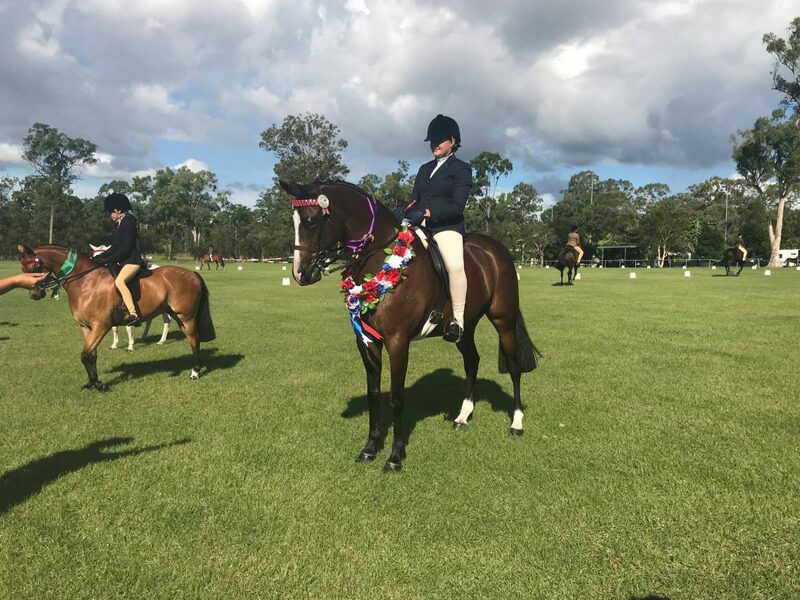 We have numerous girls, led by our Equestrian Captain Gracie Stone, competing at Interschool events and preparing for the upcoming State titles. Well done, ladies! (and loyal equines). We are very excited to have St Hilda’s very first synchronized swimmer, Kiera Gazzard as one of our St Hilda’s Sporting Girls! Kiera is in the National Synchronized Swim team and has competed both as an individual/duo and a team in Japan this April. She has also been selected to attend a camp at the AIS in May/June before flying to Los Angeles and then she jets off to Budapest in July. We look forward to hearing about your competitions Kiera and wish you the very best of luck! Congratulations to Momo Ito and Brianna Free who over the holidays competed in the 2018 Australian Youth Surf Life Saving Championships. Momo placed 12th in the swim out of 240 people, and 4th in the South Coast Branch. Brianna Free also competed in a range of events. Due to an injury at training shortly before the Championships, Brie had to pull out of some events as she didn’t feel that she was at her best (understandably so when you’ve had stitches). Love your attitude and determination Brie and we wish you all the best with your training to compete at World Titles in November/December. Outstanding performances at the recent National Swimming Championships in Sydney. We are so proud of you girls! Charlotte Mitchell – won her 100 metre relay, 2nd in 200 metre relay and 9th in her individual 200 fly race. Still will be racing 100 metre free. Carmen Jansen van Vuuren – 42nd 100 free, 39 in 50 free, 53 in 200 free and 31 in 100 fly. Lucinda Macleod – 1st 200 metre free, 12th 200 IM, 4th 200 metre back, 7th 100 meter free, 2nd in 400 metre free and 100 metre back 11th. This week we played against St Margaret’s. It was a tough game and although we lost we all tried our best. It was our first game back after the holidays and we are all excited to keep training and improving as a team. While everyone tried their hardest, special mention goes to Bella who had many breakthroughs and a few shots at goal, as well as to Emily Cook who defended really well The Junior team played a really good game despite their loss. Last Friday was the first away game for the touch football season! A big congratulations must go to all of the coaches for and to the Open, Senior A, 8B and 7B teams who all won their games. All of the teams showed great sportsmanship and teamwork throughout their games. There are many upcoming games for the girls including Wednesday the 2 May which is an away game against Somerville House and Friday 4 May against St Peter’s Lutheran College at home. We have no doubt that the girls will try their hardest and come away with some great wins. A reminder that we have the QGSSSA Cross Country Meet on Saturday 12 May at Rivermount College, Yatala. Our largest squad will also compete at our QGSSSA Cross Country Lead Up Meet on Tuesday 1 May. A massive thank you to our coaching team lead by Mrs Sharon Hannan our Director of Cross Country & Athletics and amazing coaches Kara Hawke and Lillian Price. Many of you may not know that Lilli is an elite athlete herself and specializes in middle distance running at a National level (she is also a very handy 3km runner too I hear! ).